Crevasses and seracs of the Franz Josef Glacier, New Zealand. A séracs is a very irregular ice surface on a glacier. It may include an impenetrable system of pillars and pinnacles several meters tall. 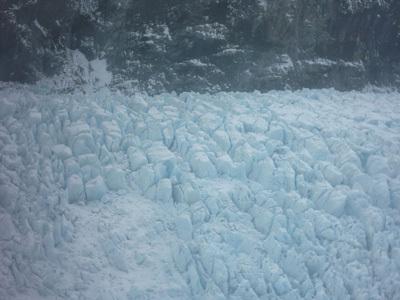 A seracs usually forms at the foot of an icefall, caused by compression of a crevassed section of the glacier. This, in turn, results from an increase in the gradient of the moving ice or because its speed is somewhat reduced.